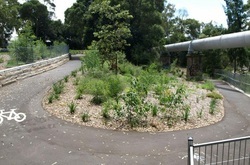 Cadigal Reserve is ﻿about 80m﻿ by 60m and includes a long narrow strip between the pathway and Hawthorne Canal at Summer Hill. It is owned by Ashfield Council and bounded by Hawthorne Canal, Grosvenor Cres, and private property. The site was first planted in the 1970s but it became a key area for IWEG when the group formed in 1999. Most of the intended revegetation areas of the site are now established, but infill planting is still required. Ashfield Council are now responsible for this site. 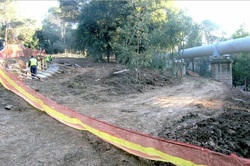 Check out the Greenway website for working bee details. About 40 local-provenance species have been planted so far, including Grey Ironbark (Eucalyptus paniculata), Turpentine (Syncapria glomulifera) and Lilli Pilly (Acmena smitthii). Much of the tube stock planted in 2007 is now well established, with some grasses, such as as Kangaroo Grass, now self seeding. 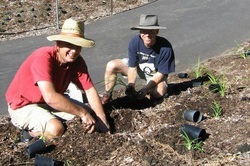 Plantings start to establish, January 2008. Possibly due to the larger established trees and proximity to water, the site attracts a large diversity of bird species, including the Sacred Kingfisher (Todiramphus sanctus), Brown Goshawk (Accipiter fasciatus) and Superb Blue Wren (Malurus cynaneus). David Rudder has compiled a list of birds species observed along Hawthorne Canal. Access to the site from the south is from Grosvenor Cres, Summer Hill. 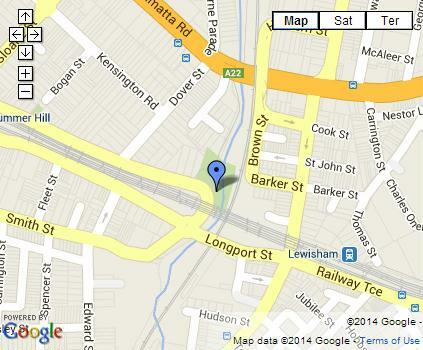 From Parramatta Rd you can enter by the footpath along the canal, or come in from the west by Haig Ave.